IMPORTANT: If PPMd block checking is disabled, the program will be unable to find a password containing PPMd blocks! Treat PPM blocks as invalid. Selecting this option will considerably decrease the load on the CPU and RAM, and reduce the GPU idle time. 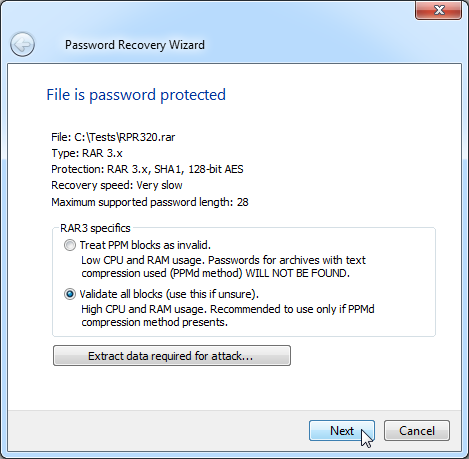 We recommend using this option if you are sure that the RAR archive you are working with did not have the "Force Text Compression" option enabled and if password recovery is being conducted on a high-performance video card, and the system becomes visibly irresponsive and slow (more details). Validate all blocks. This is the recommended option that makes the program check LZ and PPMd blocks of the archive.